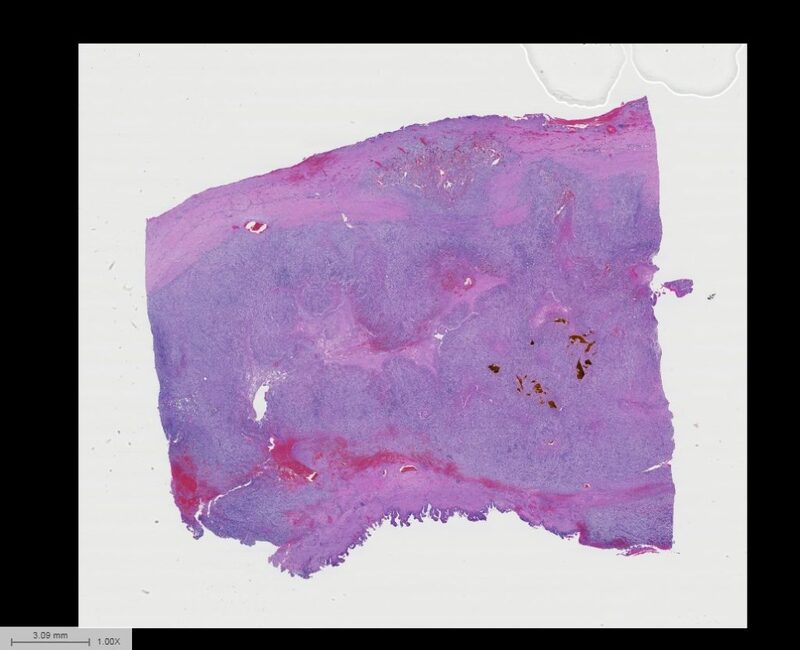 This representative section of gallbladder wall from the patient’s cholecystectomy specimen shows gallbladder mucosa with changes of chronic cholecystitis including focal reactive atypia but no dysplastic changes. 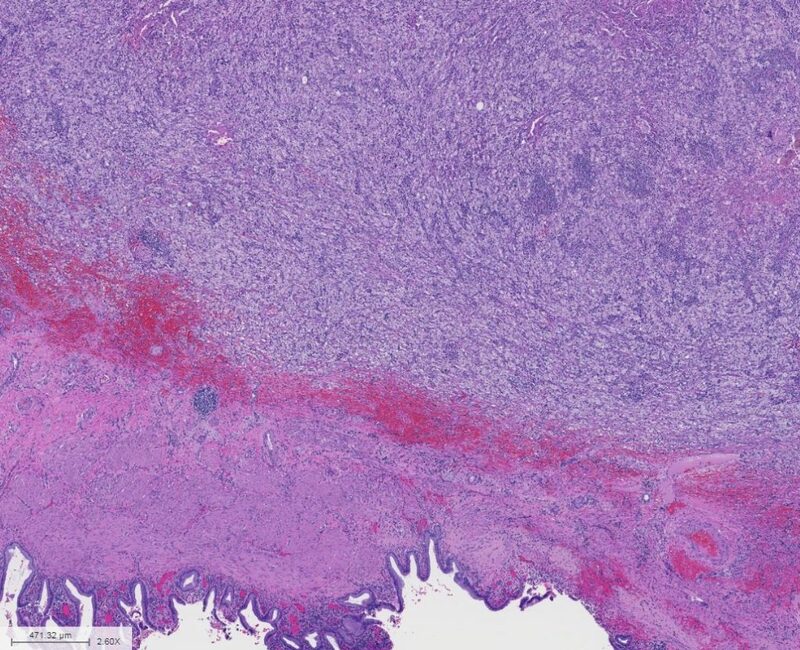 The striking feature here is the exuberant chronic inflammatory infiltrate containing an abundance of foamy histiocytes that involves the transmural thickness of the gallbladder wall. 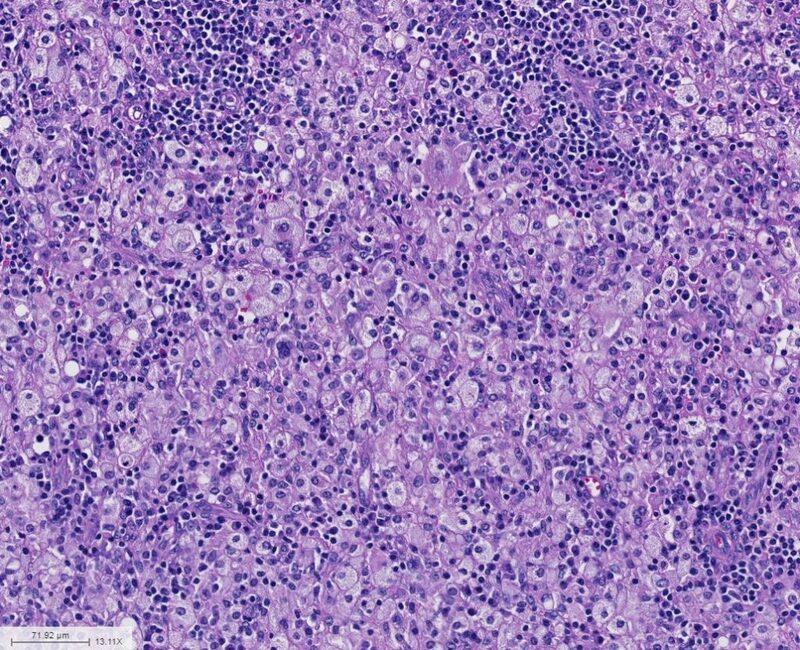 The histiocytes show no nuclear atypia. 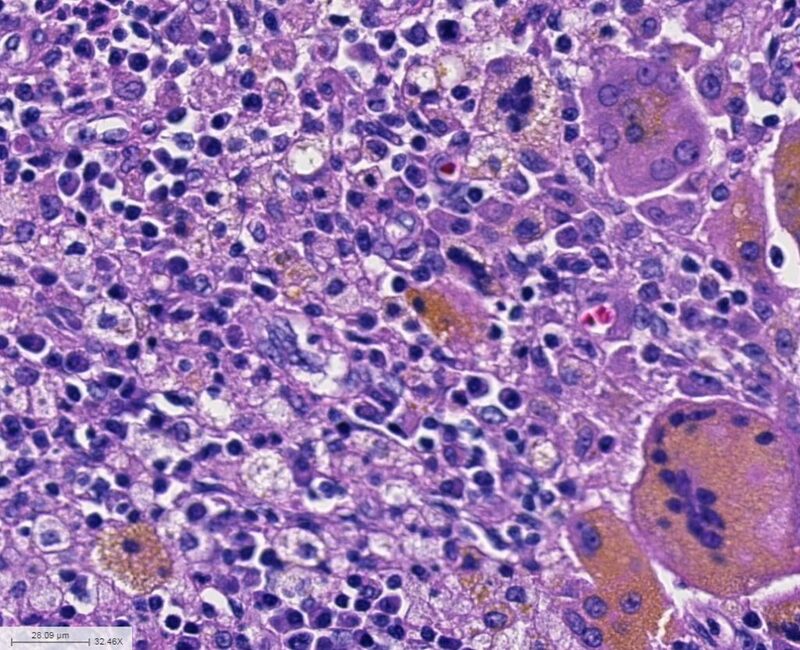 Within this histiocytic infiltrate, there is yellow bile pigment, multinucleated giant cells, and neutrophilic abscesses. 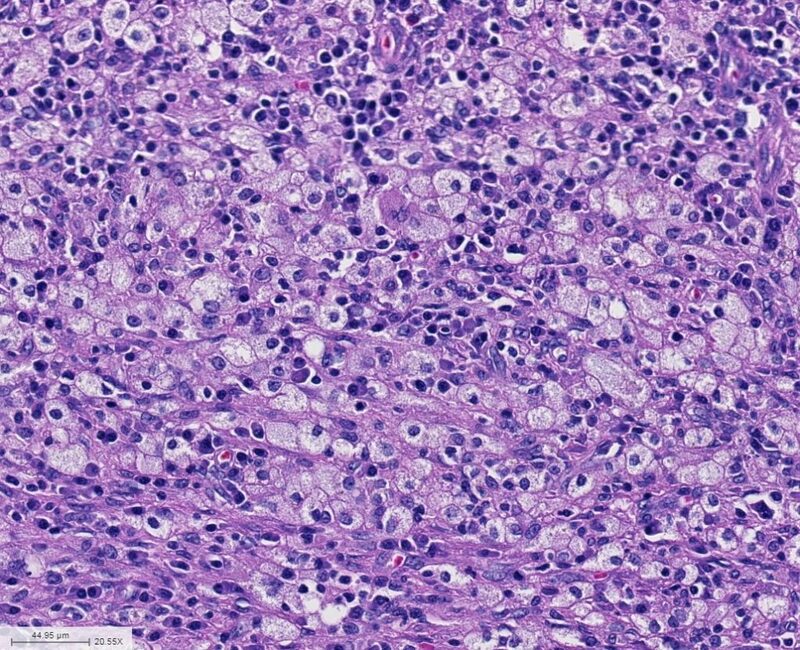 This is an example of a xanthogranulomatous cholecystitis, which often clinically mimics carcinoma due to the extensive thickening of gallbladder wall and “infiltration” or adhesion of the process into adjacent organs. Xanthogranulomatous cholecystitis is typically associated with cholelithiasis and bile duct obstruction, likely leading to rupture of the Rokitansky-Aschoff sinuses with extravasation of bile and the subsequent development of a florid inflammatory response. This is analogous to xanthogranulomatous pyelonephritis that develops in the kidney in association with kidney stones. Xanthogranulomatous cholecystitis is a non-neoplastic condition, however it can cause significant morbidity due to stricture formation and fistula/abscess formation. There is no clear association of xanthogranulomatous cholecystitis with the development of gallbladder carcinoma. 1. Goodman ZD, Ishak KG. Xanthogranulomatous cholecystitis. Am J Surg Pathol. 1981;5(7):653. 2. Fligiel S, Lewin KJ. 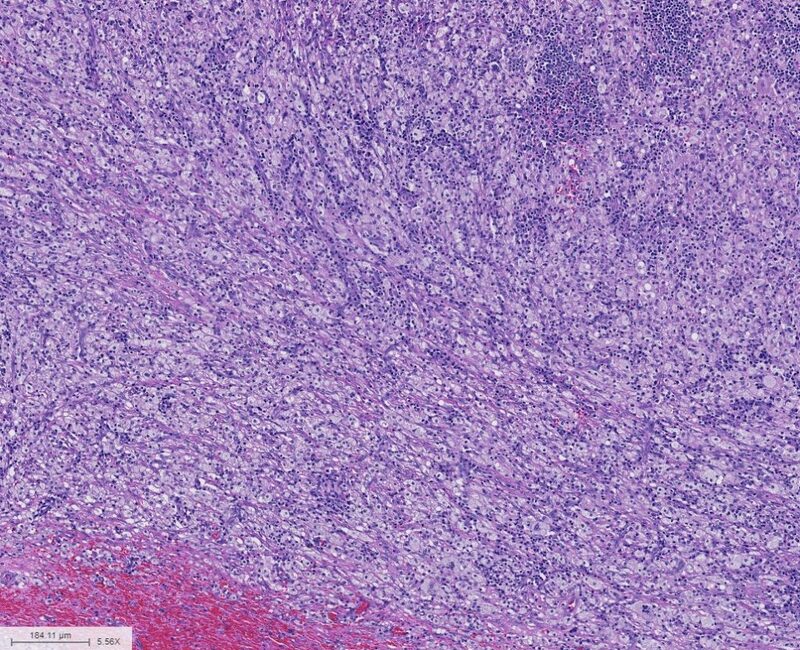 Xanthogranulomatous cholecystitis: case report and review of the literature. Arch Pathol Lab Med. 1982;106(6):302.